Is that . . . a goat in your garage?! 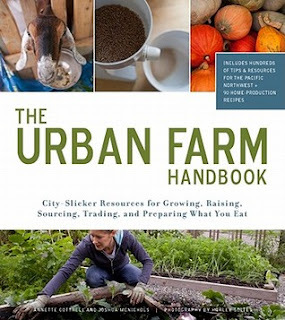 It might be if you've been reading The Urban Farm Handbook: City-Slicker Resources for Growing, Raising, Sourcing, Trading, and Preparing What You Eat. In this comprehensive guide for city-dwellers on how to wean themselves from commercial supermarkets, the authors map a plan for how to manage a busy, urban family life with home-grown foods, shared community efforts, and easy yet healthful practices. I actually have a guest reviewer today. Lou is very much an earth goddess who is heavily involved with the public herb garden at the Point Defiance Park here in Tacoma. She however isn't that computer savvy so when she wanted to do up a review on a gardening book, I asked her to send it my way so that I could put it up on my blog. I have recently had time to sit down and read if page after page. This is one of the only non-fiction books that I've read cover to cover with out skipping ahead. The URBAN FARM Handbook authored by Annette Cottrell and Joshua McNichols is a gardening/lifestyle bonanza. Written as a loose journal following the calender form with Winter as the first group of chapters. Through out the book are profiles on the people that assisted in the development of the life of a URBAN FARMER. Recipes are simple and sound oh so good. At the end of the book are a series of information pages listing plants both edible and not, a perpetual garden that included a sugar maple, plants for livestock, pollinators and cover crops that listed comfrey. There are listings of companies to go to for help and supplies. two other families have handled tough times and trying to be good to the earth. This book sounds like another sign of the times, Shai. Though our small-city dwelling family has always gardened, canned, frozen, pickled and occasionally even hunted and fished, we have yet to raise livestock or keep bees. Though hubby would go for bees in a minute (we buy honey locally in 35 lb. buckets), I am likelier to choose chickens as the next step. I think this mindset is important as folks start seeing the problems of relying on globally sourced grocery chains and choose to educate themselves. With or without a failure of the infrastructure supplying our "superstores", we all benefit by reining in our buying habits and developing local sources. 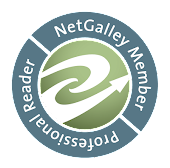 Good choice of book to share and thanks to your guest!